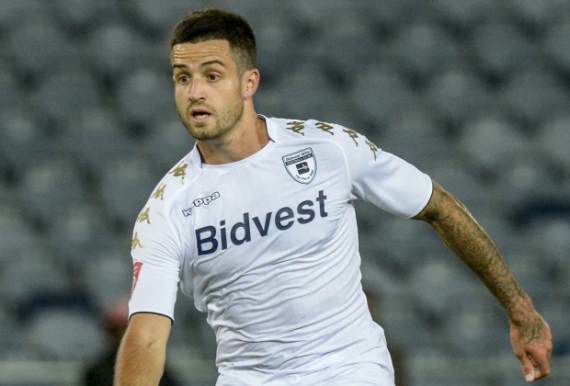 Bidvest Wits went one point clear at the Premiership summit as they came from behind to clinch a 1-1 draw with Mamelodi Sundowns at the Lucas Moripe Stadium on Sunday. Both teams had good chances to score in a goalless first half, before Pitso Mosimane's side drew first blood through Hlompho Kekana early in the second stanza. But the Clever Boys quickly restored parity from Keegan Ritchie's exquisite free-kick, which ensured they took sole ownership of top spot from Orlando Pirates. Bidvest Wits bossed the opening 15 minutes as Mamelodi struggled to cope with their pressing game in the Atteridgeville heat. Gavin Hunt's troops threatened as early as the second minute when Terrence Dzvukamanja saw his header come back off the right post from Keegan Ritchie's in-swinging free-kick on the right. The Brazilians were largely restricted to attempts from range in the opening stages, with Tiyane Mabunda blazing well over from 25 yards out in the 13th minute. Dzvukamanja was presented with another opportunity to open the scoring when a 16th-minute corner bounced up for him inside the area, but he volleyed high and wide of the left post on the turn. Sibusiso Vilakazi managed to get on the end of Lebohang Maboe's cross from the right on 19 minutes, although the forward couldn't keep his header down under pressure from Buhle Mkhwanazi. After Lehlohonolo Majoro fizzed an effort over from 22 yards out on the right in the 24th minute, the Clever Boys went close again four minutes later as Simon Murray connected with a near-post flick-on from a corner on the left, but Denis Onyango pushed his header over the crossbar. Sundowns got very little change out of the visitors in the first half, but should have broken the deadlock on 41 minutes when Toni Silva beat the offside trap from Gaston Sirino's ball over the top. Darren Keet was equal to the task, though, as he stuck out a boot to deny the Guinea-Bissau winger from 14 yards out. Onyango was called into action again two minutes before half-time and he was fortunate to see Ritchie drill a fierce shot straight at him from outside the box. Murray failed to capitalise on an absolute gift from Wayne Arendse three minutes into the second half as he latched onto the defender's poor pass and drew a good save out of Onyango from 14 yards out on the left. Chances continued to come at both ends, with Maboe getting under his first-time shot from 16 yards out in the 51st minute, before Dzvukamanja powered a header just wide of the right post from a corner moments later. Wits were made to pay for their wastefulness when Downs broke the deadlock on 56 minutes. Sirino got away from his marker with a deft turn on the right and advanced into the area before laying the ball off for Kekana, who guided a first-time shot past Keet from 17 yards out. However, the Students hit back 11 minutes later with a superb free-kick from Ritchie, who curled the ball inside the right post from 30 yards out. Mistakes started to creep in from both teams in the closing stages as the heat took its toll on the players, and Sundowns almost scored a stoppage-time winner when they caught the visiting defence cold with a ball over the top. But Vilakazi's lob was saved by Keet, although replays suggested the keeper had made contact with the ball outside his area.